Over four days, I spent some quality time coloring my August 2015 Mandala of the Month using copic markers, TEKwriter gel pens (recently bought the 100 pen set at Costco), and a white gelly roll gel pen. For days 1 & 2 I used the copic markers for all the background colors and shading. For days 3 & 4 I used the gel pens to add all the patterns and highlights. As a reference for the pattern ideas, I used a wonderful used book I found entitled “The Grammar of Ornament”, a collection of over 2,300 classic patterns. In particular I focused on the tribal patterns. 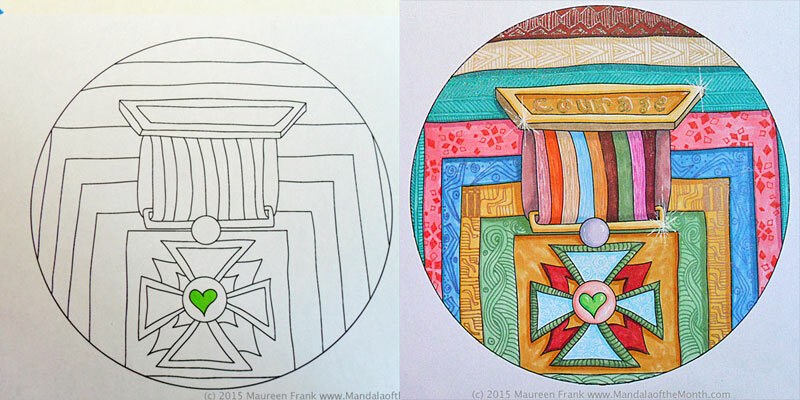 The Mandala of the Month is free to download. Join in the fun! Color it for yourself!